Huge Selection of Pet Bean Bag Chairs! 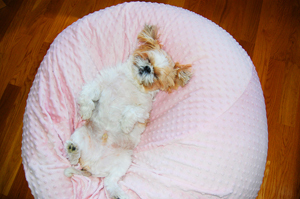 Ahh...Our bean bags hold up to your dogs & cats! We've talked a whole lot about how awesome our products are for kids, tweens, teens, and grown ups, but we haven't mentioned much about the other members of the family...the pets! 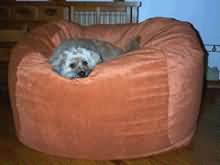 Yes, you guessed it, we offer bean bag chairs for pets! They are the same ones for your human family members, only we have discovered that dogs and cats love them too! "Perfect for my doberman! She lounges out in the giant size all day long." - L.T. Pets Can't Get Enough of Ahh! Products from Ahh Products on Vimeo. I have 2 cuddly, furry little doggies. A spazzy miniature American eskimo who is all white and looks like a snow fox (really!) and a slightly overweight and often stubborn shih tzu. I can tell you that my 2 dogs have had theirs for 10 years now! Honestly! They use them all day, every day. They nest in them, scratch around in them, play in them, and my American Eskimo always tries to hide bits of food in the center of his bean bag. He spends half an hour nudging the bean bag around to bury whatever treasure he has. Of course, my always-hungry shih tzu will come right along as soon as the Eskie is gone and steals the loot. Anyway, let me tell you about how the bean bag chairs have held up for my pets. One has the velvet cover, and the other has a cuddle soft cover. I wash the covers about once a month. My eskie sheds A LOT, all year round. The velvet seems to not really hold on to his hair, thank goodness. Basically, when I look at the cover, it's NOT all white! Both covers still look like new, even after 10 years of periodic washing. They have both held up to daily scratching, digging, and all sorts of dog play. My dogs also eat their snacks such as crumbly biscuits, stinky pig ears, and other such messy food items. For Christmas, I bought them each a knucklebone - they are still gnawing and chewing on them in their nests to this day! I can tell you with all honesty that my dogs totally love theirs and prefer to lay in them over the rug, couch, floor...even the bed! And, even better, they have held up over years of drooling, licking, eating, digging, cuddling, washing, etc. This photo was sent in by a happy and satisfied Cat-Mom customer. She says that her three cats have taken over both of her bean bags! I know that cats also like to scratch and make nests, so I'm glad our products have worked out for cat owners as well. I want to mention, though, something that's not so cute or cuddly about cats. For some reason, a handful of cats end up thinking the bean bag is a litter box. Yuck. I suppose it has something to do with being able to scratch around and move the pelletized filling inside. In any case, it's good our covers are removable and can be thrown in the washing machine! This goes for older, incontinent pets and baby puppies and kittens too I would imagine. That means our products can be in use from birth to the older years, when a soft, cushy, comfy bed is a must for achy, arthritic joints. 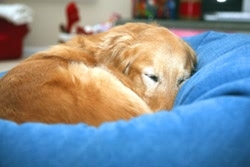 My brother's golder retriever is an older dog and she absolutely rests and relaxes in her denim one all day long. My 2 dogs are about 12 years old (not sure of their exact ages since they are rescues), so I'm sure they appreciate the body-conforming nest, too. No hard pressure points... hmmm... doesn't that sound good for us humans?! So, folks, I can whole-heartedly and with complete honesty tell you that I recommend Ahh! 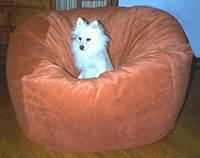 Products bean bag chairs for your pets! Tell me about your pets and their bean bags!